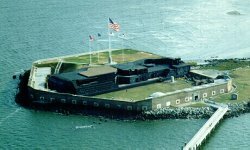 Before we go into Charleston proper, I thought we'd make a short visit to FORT SUMTER in Charleston harbor. 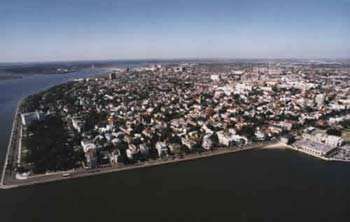 The first engagement of the Civil War took place in Fort Sumter, April 12 and 13, 1861. 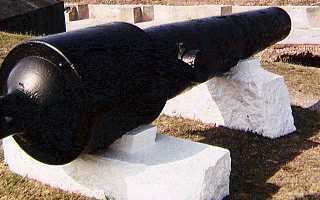 After 36 hours of fighting, the Union surrendered the fort to the Confederates. 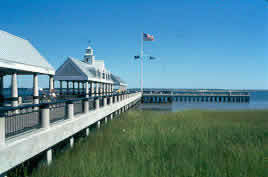 Although there was a natural sandbar in the harbor, it was still 10 feet below the surface of the water. 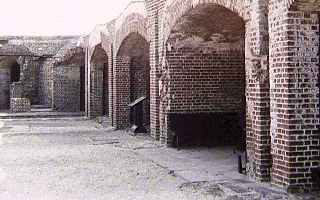 It took 20 million tons of rocks and sand to build the island on which Ft. Sumter stands. There is a plaque honoring the Union garrison that held the fort for those 36 hours. The Captain of the artillery regiment was Abner Doubleday - yes, that Abner Doubleday. Can anyone sing "Take Me Out To The Ballgame." It's April, 1670. 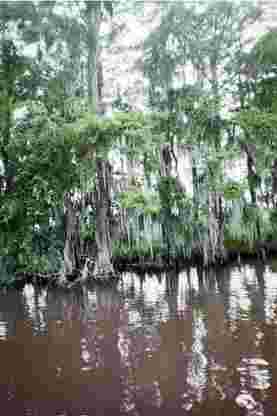 Try to imagine this city of history when its virgin forests were draped in spanish moss and populated by large alligators. 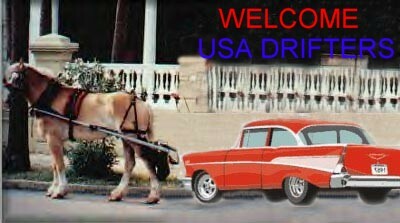 We're going to give the Chevy a break and travel Charleston by horse and carriage. This will be a pleasant ride, indeed. 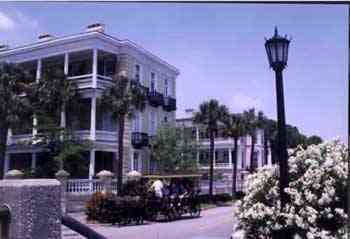 The Chevy backfired until we gave in and told it that it could come along on the Charleston tour. Don't worry...the brakes are off and the transmission is in neutral. The horse will be able to pull it easily. 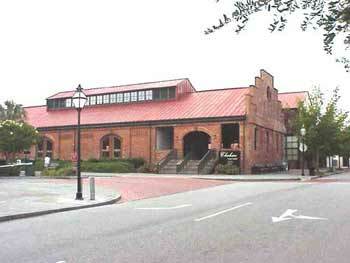 This is the Charleston Visitors Center, a good place to start our tour. 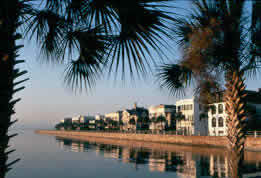 Houses on the East Battery look out over Charleston Harbor. Here we are in our carriage enjoying a ride through East Battery. 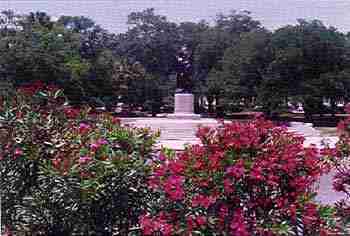 The oleander is in full bloom along the East Battery. 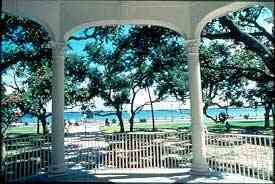 The gazebo at White Point Gardens is a perfect spot to enjoy the park. 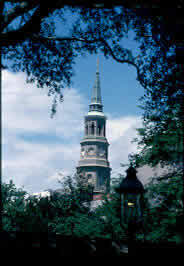 St. Phillip's Episcopal Church is the oldest church in Charleston. 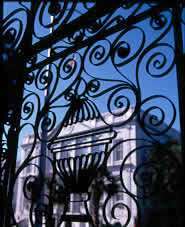 City Hall can be seen through this beautiful wrought iron gate. It's a sunny day at the docks in Waterfront Park. Hasn't this been fun, and the weather is gorgeous today. The horse isn't tired; these rubber-wheeled carriages roll along very easily. 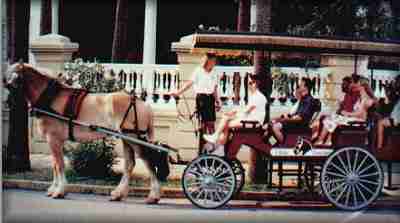 Let's continue our carriage ride around Charleston. Just click on the little carriage below, and we're off.